I'd always been interested in fixing, but I'd never owned a fix. That all changed a few months back, when I started spending my lunchtimes searching the pawnshops for fixer parts. 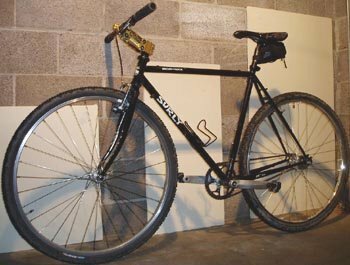 Since my onespeed dabblings to date had all been on singlespeed commuters, I knew I wasn't yet up to dedicated fixing offroad. I wanted a flip-flop setup, something that would let me singlespeed over the courses that my skills/lungs/legs weren't yet equal to. After a couple of false starts, I ended up on a Surly Croscheck. Most 63xc.com readers will be pretty familiar with the 'Check, but mine has some special features I wanted to highlight. When I first got the 'Check, I set it up with a 63.5" (40x17). No go. Then I tried a 61.9" (39x17). Still no go. After all, I ride trails in the mountains and I'm a human being, not a monster. So I went back to the drawing board and started to spec a drivetrain which would allow me a range of setups, including road gears and some ultralow options for the real hills, with a minimum of effort. My big idea was to use a SRAM chain with two PowerLinks. This works pretty well. My 42t road ring gives me 66.7" fixed (42x17) and 63.1" free (42x18) for commuting. For mountain riding, I change down to a 32t ring and knock three links out of the chain with the second PowerLink, giving me 50.8" fixed (32x17) and 48.0" free (32x18). 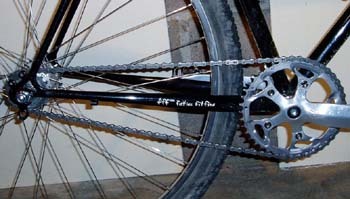 And, for an extra low end, I can add an extra link to the chain and swap the 18t freewheel for a 20t. How well do the PowerLinks stand hard riding? At first, I was a little wary about putting weight on the chain, but I needn't have worried. During one all-out climb, I managed to pull my original 39t ring off the spider and snap it in half! In fact, if your chainline is good, your chain is unlikely to cause problems. The ring is a different story. Check your bolts regularly--offroad use will shake them loose PDQ. Use Loctite if you use the same ring all the time. If you change things around like I do, insert the bolts from the back of the spider--that is, nuts outside. Not only will this make it easier to tighten the bolts, but they'll likely grip better. 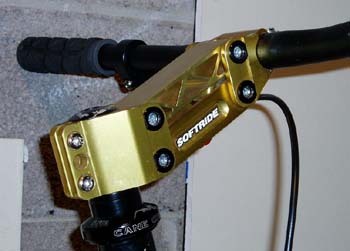 Softride? What is that monstrosity? Well, you might remember Thomas Frisknobodyknowshowtospellit winning a World Championship using one of these. Or maybe you've checked the prices and weights of 29"/700c suspension forks. I've ridden Softrides since 1990 without any problems. I love 'em. $99 and a little over a pound of weight gets you 2" of adjustable travel. They're out of production, but Softride still has old stock for sale, or you can find one on eBay. There is one problem with the Surly. All my friends want to ride it! I've had to promise to help them build up their old hard tails into flip flop singlespeeds this winter. Keep the rubber side down and the pedals movin'! Christopher Garrett squeezes fish for fun and money in Denver, CO and the western U.S. He reportedly changes his bike setup more often than his skivies. Surly are long-term 63xc.com faves, and they have their own website. Raoul Morley of Ferrous reviewed the 'Check for us in Spring 04.